3D printing is taking a turn towards making things healthier. While it’s been possible to print chocolate, pizza, and candy for a while, it is now possible to print a new, and somewhat healthier, alternative: reconstructed fruit. UK-based studio, Dovetailed, is a Cambridge design studio with a passion for crafting engaging new experiences with preexisting platforms –such as 3D printing. Their latest? A device that lets you print out your five a day. On Saturday, the Dovetailed team announced the launch of their new 3D fruit printer that uses a special technique to print out liquid drops of fruit, allowing you to combine different flavored fruits to make your desired flavor. 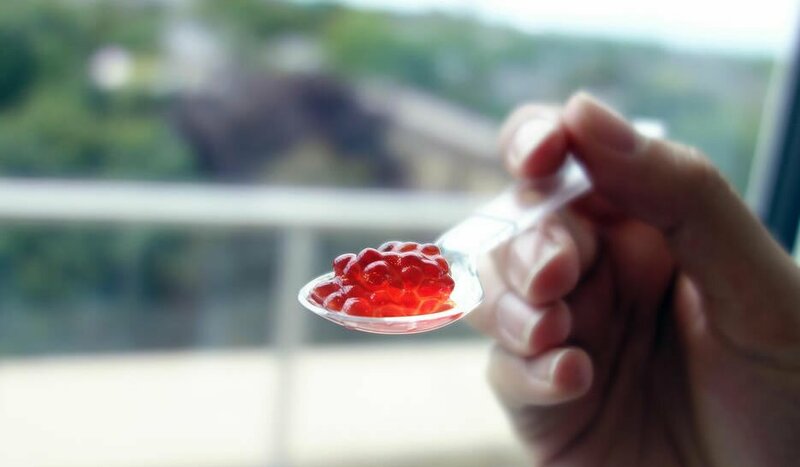 While the flavors don’t form the exact shape of the actual fruit, it instead uses a molecular gastronomy technique that converts liquid into gelatinous droplets of fruit juice. The fruit that is produced is also organic. The device allows you to easily customize the taste and texture of the fruit, without requiring that you know anything about molecular-gastronomy. The 3D fruit printer was unveiled on Saturday at the “TechFoodHack” in Cambridge, an event organized by Dovetailed and Microsoft Research. TechFoodHack is a dining “hackathon” event, where a group gathers to experiment, design, and hack new dining experiences using locally sourced ingredients.